The ‘Dublin Lockdown of 2011’ didn’t go unnoticed by that city’s citizens, but was notable for how casually it was imposed; and for the hole in mainstream comment where criticisms of the basic infringement of civil liberties it constituted should have been. 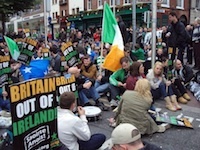 In Ireland’s ‘New Emergency’, writes avowed anti-nationalist ‘Dublin Dilettante’ (circumlimina.wordpress.com), the time is never right for questions, let alone protest. It won’t have escaped your attention that certain historic events were afoot in Dublin last week. How do we know they were historic? Partly because every news bulletin hammered home the historic nature of the Queen’s historic footsteps through historic Dublin’s historic streets, in the historic course of an historic visit which will echo, historically, in the historic history books of historical history. Last Tuesday, however, on the first day of the Queen of England’s visit, certain flies infiltrated the historic ointment. Like all the worst flies, they were, if the outraged histrionics of Middle Ireland were to be believed, dirty, disease-ridden and disgustingly common. Let me clarify a few things before I proceed. There are few sights which distress me more than Celtic jerseys and ranks of tricolours, especially when they’re combined. I will own to being fairly fanatically non- and anti-nationalist (in the broadest, rather than specifically Irish, sense). I don’t like eirigi. I think republican socialism is an oxymoron, an ideological ouroboros wherein the head devours the tail; that Connollyite national chauvinism of the eirigi/IRSP/CPI variety is a dead-end and intrinsically anti-socialist. I think attempting to shoehorn the present political status of Northern Ireland into a classical imperialist paradigm is bargain-basement ‘national liberation’ mumbo-jumbo of the most incoherent kind. I see no compelling argument for the inherent justice of this island’s territorial unification which doesn’t ultimately redound unto the purity or impurity of blood. On that basis, I wasn’t particularly exercised by the impending state visit of Queen Elizabeth II to Ireland. I knew the obsequious, hand-chafing servility of our political establishment (now entirely composed of self-seekers and opportunists; a Fianna Fail government might, strange as it sounds, have handled the occasion with marginally more dignity) would be fairly nauseating to behold, but also fairly easy to ignore. I knew the Queen was unlikely to deliver a thundering denunciation of our dole-paying, service-providing deviancy and demand that we cut further and faster, which placed her several rungs above most of our distinguished international visitors. Demonstrating against her visit seemed, therefore, a needless and potentially misguiding diversion for the left to engage in. Yes, it’s possible to raise questions about the inherent absurdity of monarchy, and the Queen’s role as titular commander-in-chief of the British armed forces’ murderous operations in Iraq, Afghanistan and, not so long ago, Northern Ireland. But to be honest, it’s a wee bit of a stretch (particularly with the actual executive power behind those ongoing outrages shortly to arrive in person), and Brid Smith didn’t make a great fist of it on Vincent Browne’s show last night. There is something to be said for the notion that the Queen’s visit represents a full stop at the end of a traumatic chapter of enmity between the peoples of Britain and Ireland; having never been aware of any such generalised enmity, I don’t see it, personally, but nor do I demean it. Equally, it’s easy to see how the gilded spectacle of a royal visit fits into the timely and convenient infantilisation of Irish culture, almost as a more stately postscript to the previous week’s Jedwardmania. Two things changed my mind, not on the substantive issues, but on the significance of the event. One was the ring of steel off-handedly thrown around Dublin for the duration of both state visits, and the extraordinarily casual breaches of what liberals call (when they don’t belong to other people) civil liberties, far exceeding the disruption occasioned by any industrial action in recent years, albeit with a markedly different response. The other was the gathering realisation that the Queen’s visit was being used by our establishment to, as Hugh Green so deftly put it, ‘draw a line under Ireland’s revolutionary history’. Now that Ireland has graciously extended the fair hand of reconciliation to Her Majesty, we could finally see that tumultuous process of dangerous, ideologically-tinged extrication from the vampiric clutches of empire for the jejune, but above all outmoded, preoccupation it is; and certainly as nothing which holds any relevance today. Equally, if not more, notable was the shock and awe campaign which constituted the unprecedented Garda presence on the streets of the capital. A stage-managed, bouquet-strewn popular euphoria might have better served the narrative, but there was a more important principle at stake. This was power communing with power, to the very definite and very conspicuous exclusion of the people. If you thought these were your streets, upon which to exult or excoriate as you saw fit, then, to coin a phrase, you could jolly well grow up and move on. It was an opportunity (denied the government by the low-key nature of the IMF’s presence) to reassert the violent and exclusionary power of the state, and the impotence of the people, in a way which hadn’t presented itself since the student protests last winter. The most visible challenge to this enforced consensus came from eirigi. Well, that’s not strictly true. In fact, most of the violence (such as it was) seemed to emanate from unaligned or differently-aligned republican groups, but eirigi, being tainted with socialism, was a better fit for the low-life, simian, working-class refusnik caricature for which Middle Ireland lusted so. Before I go on, let me add a few more disclaimers. I’m not so desperate for a foretaste of revolution that it quickens my blood to see the cops get a decent chasing, and I don’t think there’s anything heroic or particularly smart about small groups of young people without popular support throwing things at the police (in fact, a revolution could be quite neatly defined as the point at which it becomes unnecessary to throw things at the police). There is no justification, moral or tactical, in present-day Ireland for acts of aggressive violence against the state security forces. Yesterday’s violence, however, while unnecessary and unfortunate, was, much like the police presence itself, largely symbolic. The only people endangered by it were the alleged perpetrators. That said, it’s questionable whether any country in which the state’s repressive apparatus can mobilise officers in their tens of thousands, shut down the capital’s main thoroughfare, harass citizens going about their daily business, and NOT have things thrown at them has any right to call itself a healthy democracy. If you think the oh-so-delicate blossom of liberty is more threatened by a handful of working class youths lobbing missiles than by swarms of riot police excluding the citizenry from its own streets on prior presumption of guilt, then you weren’t paying much attention for most of the 20th century. The purpose of this massive police operation is to reinforce the ideological lock-down which has existed in Ireland for (conservatively) the past three years. It is about the pre-emption of politics and the stifling of dissenting voices. Now is not the time for questioning, legitimately or otherwise, the role of the British monarch or the statements such visits make about the relationship of our ruling class to their international counterparts. Now is not the time for protesting about student fees, Corrib gas or public sector pay-cuts. We are in a state of emergency. Those small bands of protesters, by their mere presence in the face of unprecedented intimidation in service of hegemony, refused to relinquish their own democratic rights and prevented the diminution of everyone else’s from going unchallenged. For that reason, I would quite happily bestow upon them an appellation which means nothing to me but may have some significance to them; patriots.